Jarrett Krause opened the doors to his classroom at Beth Shalom Early Learning Center in Squirrel Hill Friday morning. His prekindergarten students drew colorful, scribbly pictures and asked him about his long, curly hair. One day later, the 2015 Pitt alumnus was tossing that same curly hair onstage at the Mr. Roboto Project concert venue in Bloomfield with his band Soda Club — entertaining an audience of loyal friends and fans who came out in the chilling, single-digit weather to hear the group’s set. Clutching the saxophone, which he might only be seen without when he is in the classroom, Krause brought an innovative twist to the indie-pop quartet with jazzy sax solos and his smooth, deep singing voice. “Never going back again / I’m going to nowhere / I love you my friend,” he sang in unison with the petite girl holding a ukulele next to him on stage. 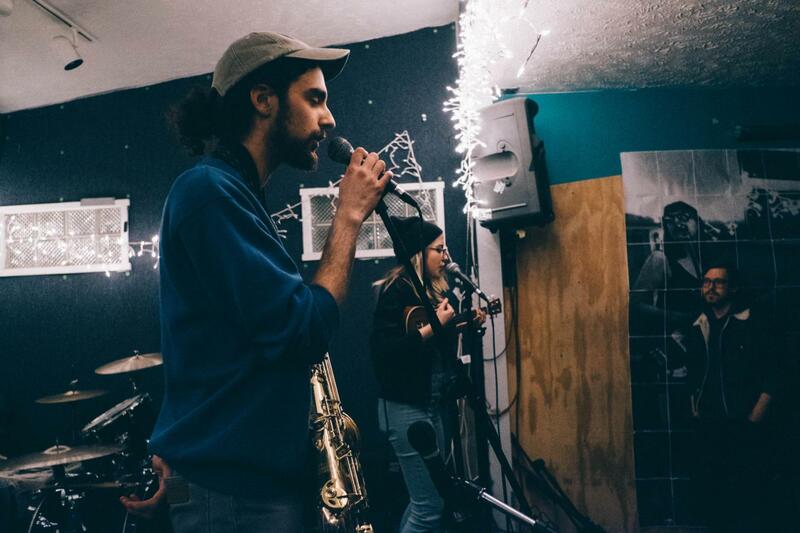 Soda Club, a band composed of three recent Pitt graduates and one student currently attending Pitt, has made a solid name for itself within the Pittsburgh DIY music scene by creating its own style of music, blending traditional pop music with instrumental jazz influences. Mason Jaynes, a student at Pitt’s School of Pharmacy and the band’s drummer, said the group itself has not identified its genre yet because it borrows from an unusual mixture of several different styles. Along with Soda Club’s bassist Tosh Chambers, a 2016 Pitt graduate, Jaynes has adjusted his playing style to a more smooth pop sound, differing from the punk band the pair formerly played in. Shay Park, Soda Club’s lead vocalist, guitarist and ukulele player, as well as a 2016 Pitt graduate, agreed with Jaynes that their style is hard to pin down. She spoke about how the label of the band can range anywhere from indie to pop to “saxpop,” a term coined just for Soda Club. “Indie is the easiest [genre to describe us], because that just means ‘not on a label,’” Park said. One Soda Club fan, Pitt student Tess Augustine, was introduced to Soda Club by her older sister in spring 2017. Augustine shared her appreciation for the original, artistic cocktail of music styles played by Soda Club. As a pioneer of its unusual style of music, Soda Club is often asked to play shows with bands of very different genres, as promoters know the band is reliable and a favorite among local music fans. Saturday night’s show also featured another Pittsburgh-based group called CALYX, Philadelphia-based punk bands Great Weights and Cottontail, and a folk rock band native to Vermont called Michael Jordan Touchdown Pass. Following a headbanging heavy metal performance from Great Weights, Soda Club offered the dreamy indie-pop sounds of drums and bass accompanied by vocalists and saxophone solos. According to Krause, Soda Club has come out of shows like that with even more fans. At the Mr. Roboto Project, a concert and art venue that functions with a volunteer-only staff, the cold was creeping in as music fans continuously opened the door of the small facility to start their evening. Spectators kept their jackets, beanies and gloves on as they applauded the musicians performing in the chilly room. Park even kept her winter hat on throughout Soda Club’s set. The group decided to pay homage to the cold by playing a fan favorite called “Pittsburgh Song.” Park opened with the lyric, “Pittsburgh’s effing cold you know,” and continued the song by singing about dreams of dealing with the cold in New York. In the year and a half that Soda Club has been together, the group has attracted a following — both within the University community and the City of Pittsburgh — sometimes playing up to four shows per month. “We get a lot of requests to play, which is great and flattering, but it is quite tiring. We all have full-time jobs, and with Mason being in school we try to schedule shows when we can,” Park said. Soda Club is familiar with plenty of different venues around the city, playing popular house venues such as The Bushnell and Cafe Verona, both located in Oakland. The band even played one of the very last shows at the now-closed James Street Gastropub and Speakeasy, a memory the musicians hold very close. Several of the band members believe this high demand may be because of their genre-bending sound. A Soda Club song starts with Park’s vocals and ukulele or guitar, and the other instruments work their way into the song. In this structure, a saxophone solo from Krause, the band’s founding member, is almost always featured. Soda Club came to be when Krause approached Park about continuing with his music career after he graduated from Pitt in 2015, and thus parted ways with Pitt Band. A musician since his elementary school days, he couldn’t envision his life without music. At that point, he and Park decided they were going to team up to create music. Park chimed in, recalling this pivotal idea that would soon become Soda Club. Many of the songs Soda Club performed Saturday came from the group’s brand new EP, which features four original songs coming out on Bandcamp Feb. 2. To celebrate this release, the band will be playing a show that day at The Bushnell with a few other local bands, including Pinstripe Sunny and Buffalo Rose. Moving forward, the future of Soda Club is unclear. Much to the disappointment of Soda Club fans and her bandmates, Park is looking to fulfill her dream of attending graduate school in New York City in fall 2018. In light of this possible deadline, the band is cranking out what it believes to be its best music on the new EP, which is titled “Enjoy.” From the band’s early days together, writing songs fit for recording was the goal.